See Harvard Business Review’s 7 simple tips for having difficult conversations for a primer. 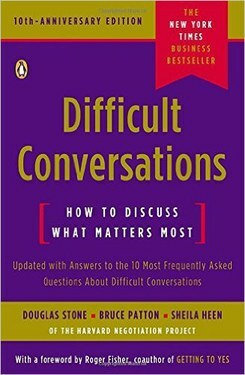 You can purchase the book Difficult Conversations: How to Discuss What Matters Most written by Douglas Stone, Bruce Patton, and Sheila Heen. Or, read this summary of the book to get an idea of the authors’ larger ideas. Conversations in which the stakes are high cause people to become defensive. Watch this video that goes over how both sides can achieve shared goals while remaining true to what they want. LinkedIn Learning (previously Lynda.com) has a video tutorial series that deals with how to conduct difficult conversations. You can start a free one month trial to view it all. The key to having a successful conversation? Empathy! Watch this TEDx Talk to understand why. Also, watch the other speakers that are recommended after this TED Talk.